Outdoor activities can be dangerous, or at the very least hazardous to your feet. The great outdoors, whether camping, backpacking, trekking, or casual hiking is far from being a gentle hobby. As every hiker or outdoor enthusiast knows, two things will determine the outcome of your trips. The first one is experience, which you can only get by getting out there. It’s understandable to lack experience, as we are all beginners at some point but there’s no reason you should ever lack knowledge. Always do the prep work, and make sure you have the proper gear as that goes hand in hand with having a safe experience in the outdoors. Updated is our top list of outdoor shoes to get you going on your next big adventure. All rated highly, tried and tested; these selections will not only protect you but also make your experience more comfortable. Read through our criteria and FAQs to help you select your next new pair! If you love the great outdoors as much as we do around here, you'll appreciate the very best in outdoor footwear. The latest update took a fresh look at outdoor shoes so we could bring you the ten best on the market as of summer, 2018. We made an effort to ensure that we were inclusive of different outdoor activities. 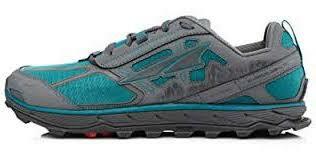 Altra has a solid reputation for high-quality products at accessible price points. The Lone Peak 4 shoes are a good example of this. They cost markedly less than some of the competitors while offering a comfortable and protective shoe that requires minimal break-in. The Altra Lone Peak 4 allows your toes to relax and spread out. For anyone that hikes frequently, you know this is a welcome addition. You will have even more comfort on your uphill climbs and downhill descents. While comfort is only one factor you should consider when it comes to outdoor shoes, it is just as important as things like durability and protection. Speaking of protection, the Lone Peak 4 shoes come with some features that work to protect your feet when outdoors. The Lone Peak 4s come with Hook and Loop tab that allows a strapless gaiter attachment. This helps to prevent debris from building up beneath the shoe and possibly injuring you. The Altra Lone Peak 4 isn't the cheapest shoe on our list but it is in line with the other options. For being our number one pick, and not being so over-the-top in price, this should definitely be a contender for your next outdoor shoe. 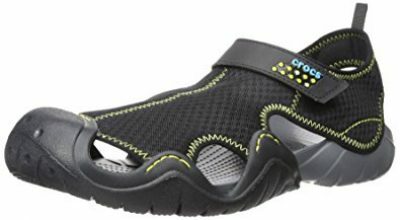 It's impossible to write about outdoor shoes without having Crocs show up on the list at least once. While it would be easy enough to have more than one pair that fits the outdoor criteria, we have narrowed it down to one great sandal they offer. 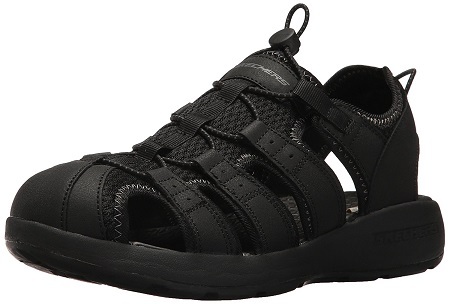 The Swiftwater sandal is perfect for those who are enjoying some outdoor water fun, and campers should find this to be the ideal pair of shoes. Adjustable, comfortable, and very relaxed this is the shoe you want to slip on when you climb out of your tent or trek down to the beach. One of the things that make Crocs so comfortable is the use of their Croslite material to build their shoes. Spongey, cushioned, and responsive, this is great material for those who want a more comfortable and relaxed shoe. While this may not be great for intense hiking or climbing adventures, the more casual outdoors person should find this shoe to be ideal. Are you planning your next camping trip near a lake, beach, stream or ocean? If so, then the Swiftwater sandal is going to be perfect footwear for your daily fun. Protective enough to wear on rocky beaches or murky lake bottoms, this shoe is made to be worn in and around the water. Your foot will stay protected, while the shoe will dry quickly and easily as soon as you're back on land. As one of the cheaper options on our list, this is a great choice for those who are more relaxed when it comes to their outdoor activities. 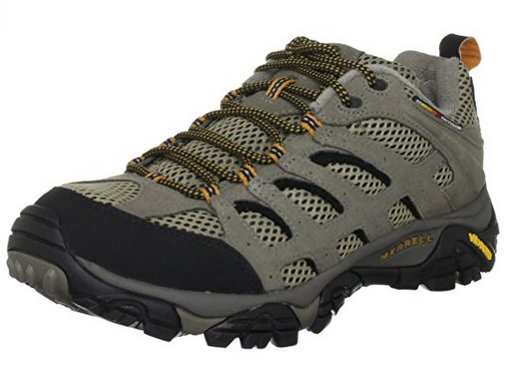 Intense hikers or trail runners will not find the support they need in this shoe, but casual hikers, nature walkers, and campers will love how comfortable and durable this shoe really is. For such a low price, these are perfect to throw in your bag before heading outdoors. The Moab Vent is Merrel’s most popular outdoor footwear product. These shoes are the combination of protection, comfort, water resistance, and weight that should be on every outdoor boot. The tough grip will keep your feet steady in place getting a solid hold of almost any terrain. Merrel’s Moab Ventilators help you step outside the box, and into the wild. The DURABLE Vibram TC5+ Rubber Outsole brings a reinforced grip for the most extreme of outdoor adventures. A combination of rubber technology and a carefully designed outsole pattern takes efficiency to another level. Merrell M-Select FIT.ECO+ blended EVA Contoured Footbeds resemble the anatomic shape of feet for a comfortable wear. Thanks to the natural form of the insoles, the fitting experience is enhanced. The MOAB Ventilator is one of the lowest prices of this list while being the number one spot for efficiency. No outdoor shoe on the market can beat this performance-to-cost ratio. There are going to be times when an outdoor shoe or boot won't fit the bill. While they tend to offer the most in protection and waterproofing, some of them will be lacking in terms of breathability, which can be a problem in the summer and more humid areas. This is where hiking sandals come in. Initially designed for fishing, the Skechers Melbo Journeyman 2 sandals provide the comfort and traction you need for outdoor adventures, with a bungee-style lacing system for a secure fit. The soft memory foam insole is designed to contour to the unique shape of your feet, providing the right amount of comfort and support. It also supports arches of any height well, allowing you to be comfortable even with extended wear. While this is not necessarily a feature unique to the Skechers brand, the bungee lacing system works to provide a custom-tailored and secure fit with little fuss. Simply adjust the lacing and use the clasp to lock it in place. The bungee lacing system also allows for more freedom of movement than some other lacing types. These sandals cost less than $60 across the board and come in a wide range of size and width options. This makes it easy to find both the right size and the right price for you. While these may not offer all of the same protections as a shoe or a boot, the lightweight design and memory foam insole make these a great choice for the summer, as well as more humid conditions where your feet may be more prone to sweating and overheating. 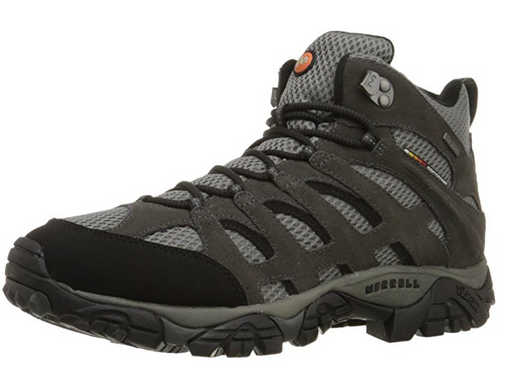 Merrel has proved to be the leading outdoor shoe manufacturer with the MOAB 2 series. Their appearance in our two best spots is no coincidence, as their effectiveness goes unmatched. The MOAB mid 2 Waterproof shares all of the features as the Ventilator. The only exceptions are the complete waterproof protection and the mid cut. The Mid Waterproof protects your feet against all kind of liquids and humidity (rivers, rain, ponds, etc.). This shoe has been quality tested for leakage, and the results confirmed their waterproofing is flawless. This shoe counts with all the features of the MOAB 2 series. These include Premium fabrics, M-Select FIT.ECO+ blended EVA contoured footbeds and the DURABLE Vibram TC5+ Rubber Outsole. Obviously more costly than lower-cut shoes. However, this boot holds one of the fairest price tags for such a quality design. Merrel once again blended optimal performance with accessible costs. Vasque’s Juxt is an all-around efficient outdoor piece. They support pretty much anything you put them up to due to its multi-sport design. Midsole and outsole technology work in amalgamation to increase grip, comfort, stability, and performance. This pair can endure hiking on rough surfaces, trail running on uneven terrains and trekking for long distances. Comfortable materials provide a smooth experience throughout the whole day. Outdoor shoes have never been this stable before. A Molded EVA functions along a TPU Plate to make every step firm and stable. No matter where you’re stepping, you can do it confidently. Vasque Off the Grid outsole is far from a general rubber one. The VOG outsole breaks the limits of grip, comfort, and durability. Venture into the mountains, trees, and rivers without any concerns. This pair was costly during the release. Though, there are loads of sales on it as of the date of this publication. Considering it’s a multi-sport shoe, it could save you from buying two different pairs. The Salomon X Ultra Mid 2 was a fan favorite, and their successor was released in late 2017. It builds on the high-quality design of the 2, while updating the lacing system and outsole for improved traction on rough terrain or when going downhill. The lightweight design almost feels like a trail-running shoe when you put them on while providing the same traction and durability as more heavy-duty outdoor shoes. The lightweight material of the Ultra Mid 3 helps to make sure that you are able to hike for long periods of time without becoming overly tired. But, even with the lightweight materials, there is plenty of comfort in these boots. When it comes out outdoor adventures, proper traction is important. You don't want to lose your footing on uneven terrain or when going downhill, as this can cause injuries and embarrassing falls. 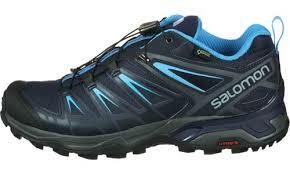 Salomon has redesigned the outsole on the X Ultra Mid 3, using two types of rubber and special patterning on the heel. This ensures that you'll have a solid grip, whether you're on uneven terrain or moving quickly. Salomon products are known to fetch a premium, but this is for a good reason. When it comes to any kind of footwear you get what you pay for, and the Salomon X Ultra Mid 3 will be s solid investment for seasons to come. The Renegade GTX is made for any circumstances, outdoor activities, and weathers. The Vibram outsole will grip onto anything it encounters, and the midsole features protective and durable materials. An adaptive footbed responds to all weathers with responsive climate-control technology. The padded tongue and collar offer superior comfort and stop debris from getting into the shoe. Climate-adaptive technology on the footbed responds to different climatic circumstances. By retaining heat or releasing it, the Renegade can adapt your feet to both winter and summer situations. The Vibram EVO outsole has an excellent grip on all kind of surfaces and terrains. The rubber compound protects your heel and guarantees a durable use. A polyurethane MONOWRAP frame on the midsole delivers, even more, durability, shock control, and comfort. Lowa’s Renegade is nowhere near cheap. The shoe is considerably expensive in comparison to other items in this list, while not being the best one. Though, this pair is efficient in many kinds of weather and circumstances. Don’t let the classic style of the Salomon Ultra 3 fool you. As an update from the Ultra 2, this shoe is not packed with even more external technical looks, but it doesn’t lack performance by any means. The Ultra 3 is a highly functional blending of technology and classic design. The precision build features flexibility, durability, grip, and every other feature that composes a fitting outdoor shoe. A lightweight frame is located between the midsole and the outsole the optimize motion management and energy administration. The Advanced Chassis also provides protection, stability, and support. The Ultra 3 includes an OrthoLite cushioned insole that augments comfort and avoids heel soreness. The insole also protects your feet from humidity and odors. The price of this shoe is a bit above standard. Not cheap, but not that expensive either. Taking into consideration its outdoor performance, the price of this pair is worth it. Hiking, climbing, and trail running are no obstacles when wearing a pair of these. Updated from the previous Ultra 109, the Ultra 110 delivers quality outdoor performance with its multifunctional build. Waterproof protection keeps your feet dry on rivers, ponds, and rain. Protection is a priority when performing outdoor activities, which is why this shoe has a protective TPU toe cap. The materials of this build are comfortable, lightweight, and durable., lightweight, and durable. GORETEX Waterproof not only keeps water away from your feet but also heat. A breathable membrane stops the waterproof lining from sealing the heat inside the shoe. Instead, it allows vapor to go out and to allow air to move in. An UltrATAC rubber sole delivers every element required for optimal outdoor implementation. They go from running stability to a sturdy grip that supports all kind of terrains. When you’re at the mountain, the Ultra 109 GTX make sure you stay on the mountain. This pair is considerably more expensive than some other shoes on this list. But, this doesn’t mean they aren’t worth their quality. The Ultra 109 GTX delivers professional performance; you can’t get pro for cheap. The outsole is one of the most important parts of an outdoor shoe, especially for hiking. Unlike ordinary shoes, many outdoor activities require a particular kind of outsole. 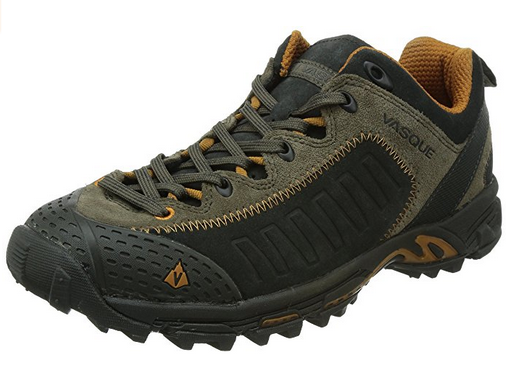 Hiking shoes must have a thick rubber outsole to for decent performance in off-road terrains. Materials other than rubber (or derivate) are not recommended for hiking shoes. The best hiking shoes have an adherent or “sticky” rubber component that maximizes contact between the outsole and any surface. This kind of technology is what you should be looking for in an outdoor shoe. There’s a significant difference between the grip of a basic running shoe’s outsole and a hiking shoe’s outsole. For starters, the quality of the grip on the best hiking shoes is much, much superior. The outsole of an outdoor shoe must be able to grip to rocks, uneven surfaces, mud, dirt, and more. When going hiking, you want to make sure you can completely rely on your outsole. At the end of the day, the outsole grip is what determines the outcome of each step. The main factors that define the quality of an outsole are its materials, the grip, the stability, and responsiveness. Poor materials will result in an entirely degraded outsole in one month. A weak grip is something you just can’t have in your shoe; it’s a 100% you’ll-fall-guarantee. The sole can’t be too high, as stability would decrease. If you want stability, you can’t float in an 8cm sole. Lastly, a responsive outsole protects you from having smashed heels after hiking or trail running for 30 minutes. There’s a little bit of a difference when it comes to the durability of an average shoe vs. an outdoor shoe. The main difference is that you can use your outdoor wear like walking shoes – and look good while doing so. But it doesn’t work like that the other way around. Using your casual walking wear will make you look more like a newbie, not to mention that those shoes are going to get wrecked. It’s as simple as this: regular shoes can’t endure outdoor activities. You need materials that resist rocks, scratches, water, and heavy duty usage. Think of it as placing a big motor in a small car, and the other way around. The small car still works with a larger engine, but the big one can’t run with a smaller one. When going on outdoor adventures, you’ll encounter roots, mud, dirt, water, debris, rocks, and another bunch of obstacles. The issue is not what you meet; what is important is that your shoes are prepared for it. We know outdoor shoes are not cheap, which is why we gathered a list of durable shoes that feature resistant builds. Nobody likes throwing money down the drain, just like nobody likes having to replace shoes after one month. You have two options when it comes to durable materials: leathers and synthetics. The toughest one is unquestionably reverse full-grain leather. However, other factors such as weight, waterproofing, and versatility play a role when choosing materials. For camping and other light outdoor activities, rubber shoes are also a great choice, along with mesh uppers as these will remain breathable as well as offering waterproof or quick drying properties. Trekking, hiking, and trail running are unquestionably rough activities. This goes for both our feet and our shoes. It’s important that the materials are sturdy enough to protect the pump from degrading. However, it’s even more important to protect our feet. Multiple factors have an impact on the protection the shoe provides to our feet. There are three kinds of outdoor shoes: low cut, mid cut, and high cut. The most protective of them all is unquestionably the high cut. It covers up to the shin, offering maximum protection. Though the cut you need depends on the activity, you’re looking to perform. For something versatile like trail running, high boots are the last option on the list. For something like backpack trekking or hiking, consider taking mid or high cuts. Waterproofing is one of the most important factors that affect protection. Depending on the activity and the surroundings, waterproof protection might or might not be essential. However, if there are any chances you’ll have to deal with water, waterproof shoes make a huge difference. Water has a chain of effects on the performance if you’re not prepared for it. For starters, it will soak your feet affecting comfort, fit, and stability in every motion. The boot will also become significantly heavier if the materials absorb water instead of repelling it. Some outdoor shoes have a distinctive tongue design that prevents debris from going into the shoe. We highly recommend looking for shoes with this feature. Anyone who’s hiked before knows how annoying it is to remove the boot because of debris in it. This is especially annoying when wearing high boots and a backpack. But aside from being annoying, no protection on the inside prevents you from stepping on small rocks and edgy remains. The grip is the most essential element of the outsole, and probably the whole shoe. The grip determines the quality of the contact between the shoe and the surface. If the grip is loose and there is no traction, the shoe slips. When doing outdoor activities, shoes should have as much traction as you can get. Multiple sub-factors contribute to the value of the grip. For a better grip, we encourage the use of your natural feet and toe strength along with proper technique. However, technologies such as heel brakes make it easier by reducing the chances of the outsole slipping or sliding. Never rely on such technology as the base of your grip – it works as assistance. Other contributing elements are lug patterns on the outsole. Lug patterns dig into the surface (mud, rocks, grass, dirt), helping your feet make each motion smoother. The deeper the lugs are, the better traction the shoe will have. But, you should always consider the kind of activity you’re going to perform. For trail running, deep lugs are not the ideal choice, as they’ll dig too deep into the ground. This would decrease the running performance, as each gait would require more effort and running would be difficult. As things get more difficult, you’ll need more grip. For instance, the grip is the number one priority when hiking steep elevations (or descents). When doing heavy activities, your shoe must be able to grip to any surface you encounter. Each step needs to be confident and firm, and that can’t happen if you can’t get a good grasp of the surface. This is underrated in all kind of performance shoes. We can’t say it enough; uncomforting shoes will never let you reach optimal performance. Some people make the mistake of forcing themselves into uncomforting shoes. If a shoe feels uncomfortable, it means there’s something wrong. Uncomfortable shoes are not an option for outdoor activities. Off-road events alone are harsh for our feet, imagine adding hours of unpleasant experience on top of that. Comfort is directly related to your technique. The more comfortable you are, the best you’ll do. Various things mark the level of comfortability in a shoe. Cushioning is the first one. An outdoor shoe must have enough cushioning to support comfortable motions; especially trail running ones. Most shoe brands apply their own cushioning and shock absorption technologies on their designs. For instance, Merrel’s Air Cushioning Midsole diminishes impact, increases comfort and offers more stability. The materials are another factor. If the shoe materials are completely stiff, any motion becomes uncomfortable. Don’t get us wrong – outdoor boots must be firm. However, there’s a difference between firm and inflexible. Flexibility is a must to execute motions in a natural manner. A shoe should never become an obstacle to your motions. The best outdoor shoes will flex as your feet require it, resembling their movement as naturally as possible. Depending on the location and weather, you should be looking for a breathable shoe or one that retains heat. A breathable shoe is the last thing you want in winter. Look for something that seals your feet away from the cold, as it’s important to keep them warm. In hot locations it’s the whole opposite; heat should not accumulate on the inner shoe. No matter where you are, one thing is for sure; you’ll need waterproofing. Wet shoes (and feet) will become an uncomfortable obstacle anywhere, anytime. Many shoes made for outdoor adventures are also easily cleaned. A damp towel with soap and water usually can clean up on canvas, waterproof or weather resistant leather, synthetics, or mesh. Besides keeping your outdoor footwear clean, there are a few things you can do to extend the lifespan of your footwear. Check for brand or products which are resoleable, or have parts that are easily replaced. Try to keep your footwear in a cool place where heat won't expose them to degradation, and out of any moisture ridden environments to prevent mold or mildew buildup. Everyone knows the sensation of having their feet in a microwave. We’ve all made the unfortunate mistake of buying completely sealed shoes at some point. Breathability is one of the features you can’t lack on any shoe, not to mention outdoor ones. Luckily for us, almost all shoes feature breathable materials nowadays. Having a consistent flow of air through the shoe is important. Some waterproofing technologies make the mistake of sealing the upper entirely. Waterproof protection is important, yeah, but not at the cost of breathability. Technologies such as GORETEX offer absolute waterproof protection while still maintaining a decent breathability. This is due to a breathable membrane that allows vapor to leave the shoe without allowing water to breach into it. The upper side of an outdoor shoe must always use breathable materials. The best shoes apply materials such as mesh in combination with strong leathers. The places where heat concentrates the most are the sides of the shoe, the toe box, and beneath the tongue. Mesh panels are often applied strategically around those areas to prevent overheating without using too much mesh. The issue with breathable materials is that they’re much thinner, thus more delicate. Due to this, they must work in combination with tougher fabrics. The lack of breathable materials in a shoe will result in overheated feet. It’s especially important to have breathable shoes in hot environments, as they contribute to heat accumulation. Overheating can get to a point where you’re no longer able to perform due to extreme uncomforting. In fact, it goes beyond discomfort; the concentration of heat will irritate your feet. Our extremities, such and hands, and feet, are the parts of the body that release the most heat during exercise. Think of closed shoes as sealed leather gloves; nobody wears them on a sunny day. If this heat is sealed inside the shoe, you’ll boil your feet with their vapor. The quality of your shoes will have a considerable impact on both performance and safety. When it comes to security, outdoor activities demand attention to safety. A quality outsole makes the difference between a secure grip and an injury due to slipping. The surfaces and terrain involved in outdoor sports are different from regular sportswear, thus you need different shoes. Regular shoes may seem like a good option at first – but they’re not. A basic running shoe has a completely different build than an outdoor one; from the upper frame to the midsole and the outsole. Sports shoes are generally designed for surfaces such as pavement or grass, which is not the case of trail running or hiking. Depending on the circumstances, the lack of an outdoor-specific outsole can result in serious injury. As you can guess, an outdoor outsole is not something you find in all running shoes. Leaving security aside, performance and durability are also affected if not wearing the adequate shoes. For instance, the materials of some running shoes won’t necessarily survive in outdoor conditions. Outdoor shoes, on the other hand, are specifically made to resist the toughest of environments – while maintaining comfort and performance at the maximum. This is also true for sandals and camping related shoes, while they may not need to be as durable, you are going to look for very specific materials and styles. q: What are outdoor shoes? 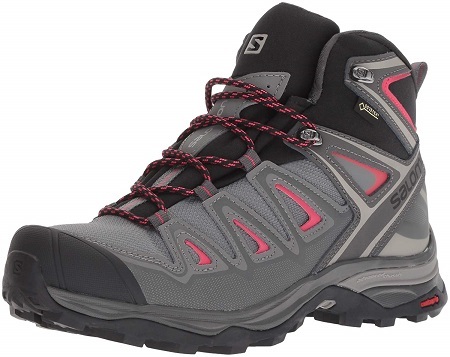 Footwear specifically made for outdoor activities, such as hiking and trekking, and climbing. These are far different than simply walking or running, and as such footwear designed for these purposes will need to be designed and built accordingly. q: Where should I buy outdoor shoes? The best deals are typically found online. We have seen that Amazon has a quite generous and merely return/exchange policy, so if you find you've purchased the wrong size or fit it's easy to correct. Though if size and overall fit is your primary concern, you may want to go to a brick and mortar store so you can try the shoes on before making a purchase. q: Should I buy a lower shoe or a boot? This depends on what you will be doing with them. 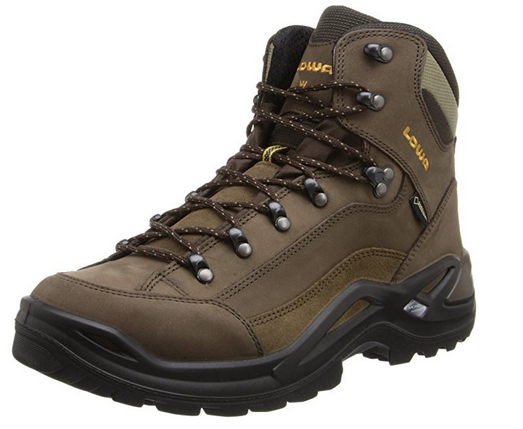 Boots typically offer more support and protection and are best suited for hiking. Lower shoes provide more flexibility and freedom of movement, making them ideal for activities where lateral motions are essential, such as climbing. q: Do these shoes degrade with water? No. Even those without a water-resistant build will be able to stand up to some degree of water. Outdoor shoes are also typically made to dry quickly in the event they do get wet, keeping your feet from feeling damp and gross and working to mitigate the potential for odor and irritation.